In the 1930s when cinema was at its peak. The Belgian Refugees were entertained by Mr Franklin at Saturday's matinee at the Royal Theatre. 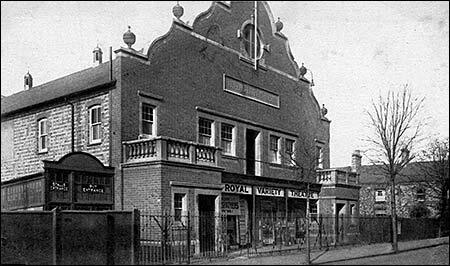 When the Royal Theatre closes tomorrow night Rushden will have only one cinema. The property has been bought by Croyland Motors Ltd., Wellingborough, who have been given planning permission for conversion into a motor showroom. Mr. G. Lilley, of Higham Ferrers, the manager, told the Chronicle and Echo that the theatre opened on September 23, 1911, and he had been planning to celebrate the 50th anniversary. During the final show he will screen part of an old-time "silent" Western to contrast with current films. Marie Lloyd was one of the variety artists who appeared on the Royal stage. Mr. Lilley said he had no immediate plans for future employmenthe is due in hospital soon for an operation.